File this under: Same song, different verse. In May, the University of New Mexico announced that Dreamstyle Remodeling would be the new naming-rights holder for The Pit and University Stadium. The agreement had the Albuquerque company paying UNM $10 million for the next decade of sponsorship. It piggybacked off the faltered deal UNM had struck, three years before, with WisePies Pizza and Salad. Ultimately, Larry Chavez, the owner of Dreamstyle, gave a copy of the agreement to the Journal. But local businessmen and out-of-state executives ought not be the ones to determine whether the public can inspect the records of deals made on behalf of their tax-funded institutions. In recent months, we’ve hit a familiar brick wall in trying to get documents from Lobo Sports Properties. UNM has rejected our requests, and LSP has simply ignored them. Today, we filed suit in New Mexico state court, arguing that these record-request denials constitute a clear violation of the state’s Inspection of Public Records Act. In our suit, we have named Learfield, Lobo Sports Properties, and UNM’s Board of Regents as defendants. You can read the full civil complaint (with exhibits) here. This is our second IPRA lawsuit revolving around Lobo Athletics. In March, we sued the University of New Mexico Foundation over its refusal to provide records relating to the WisePies deal. In that case, we have argued that UNMF is, by the lights of IPRA, a public body that maintains public documents. That action is pending. In this case, we’re not arguing that Lobo Sports Properties is a public body but, rather that, as a contractor for the university, it maintains public records subject to disclosure. Given its relationship to UNM Athletics, a department currently besieged by state audits and investigations, we think there’s a strong public interest in bringing this relationship into clearer focus and brighter lights. While our litigation is circumscribed in New Mexico, the theory of our case could potentially have national implications. Learfield Licensing Partners represents hundreds of college sports programs across the country. Its marriage to UNM dates back to 2007, when it won out a public bidding process to serve as the school’s multi-media and sponsorship rights partner. As it has done with its other university-clients, Learfield created Lobo Sports Properties, a Missouri-based LLC, as the vehicle to service its UNM account. The agreement between Learfield and UNM appointed LSP as the exclusive agent for obtaining the school’s sponsorship agreements. Learfield also maintains the broadcast rights to UNM football and men’s basketball games, the most sumptuous piece of that pie. Through LSP, Learfield has agreed to pay UNM a gradually increasing guaranteed licensing fee ($4,868,000 for 2017-18), a $250,000 one-off payment next month, and 50 percent of any revenue LSP brings in above a certain threshold (currently $7,588,000). Learfield pockets whatever else it accrues from its UNM sponsorship and licensing deals. The Learfield-UNM agreement stipulates that in instances where UNM enters into a naming-rights agreement with a private entity, thus diminishing Learfield’s ability to obtain sponsorships for that venue, the school will negotiate a reasonable fee to compensate the company. In the case of the Dreamstyle agreement, $100,000 will flow to Learfield each of the next ten years. In addition to Dreamstyle, Lobo Sports Properties is also the signatory in the naming-rights agreement for Santa Ana Star Field, UNM’s baseball stadium. It seems axiomatic that Learfield is doing the work of a public institution itself. The four employees of Lobo Sports Properties are listed on the Athletic Department website and work in the Athletics administration building. The Learfield-UNM agreement even specifies how proximate the LSP employee parking spaces must be to the university’s athletics facilities. 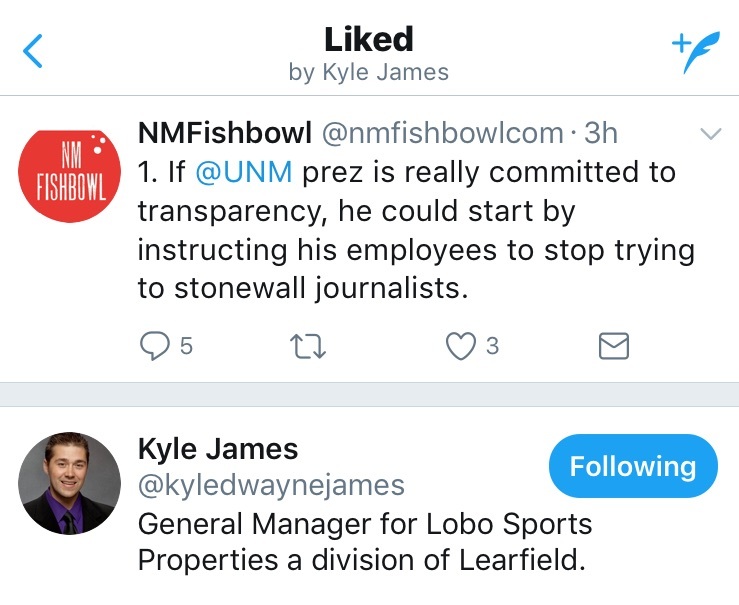 Two days after the Dreamstyle presser, I requested all copies of communications between employees of Lobo Sports Properties and employees of the UNM Foundation. The university’s public records custodian denied my request. It subsequently denied similar requests I made for communications between employees of LSP and Dreamstyle Remodeling, Tamaya Enterprises (Santa Ana Star Casino), as well as any other licensing agreement entered into by LSP on behalf of the school. We will update this story if UNM, Learfield or Lobo Sports Properties cares to comment.